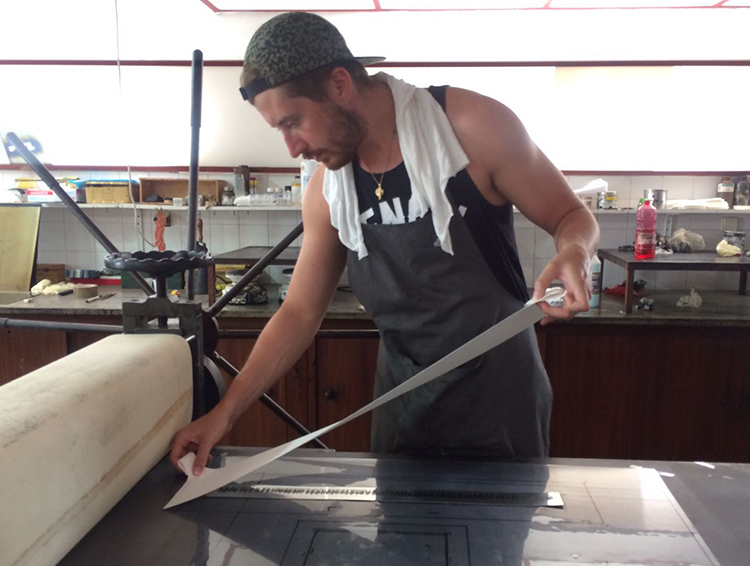 MA Printmaking graduate Luke Wade took over our blog to journal his summer residency in Portugal. 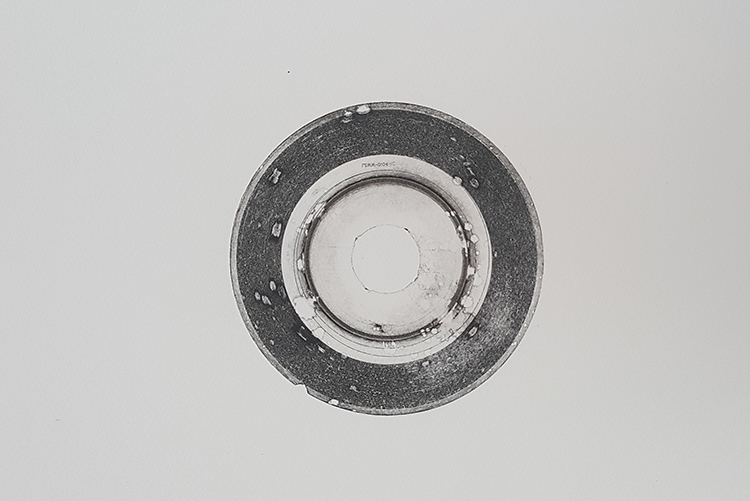 Luke won the annual Oficina Bartolomeu dos Santos (OBS) residency at the distinguished studio of Portuguese printmaker Bartolomeu dos Santos in Tavira, Portugal. 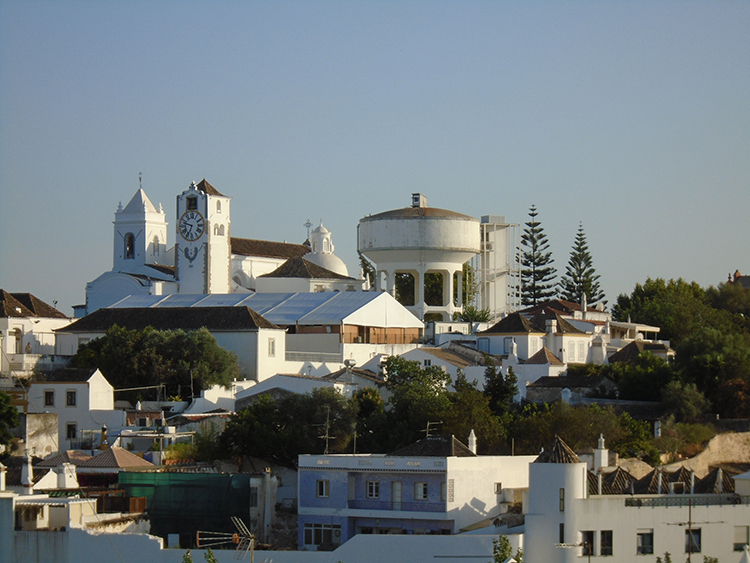 Luke split his takeover into two parts, in part one of his blog piece, Luke had just arrived in Tavira and was acclimatising to working in a foreign studio. 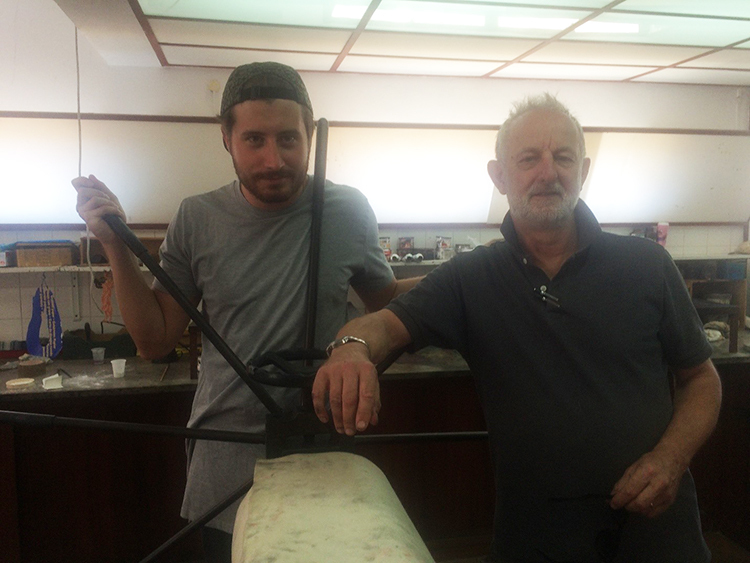 You can read about Luke’s first week in Portugal, the work he produced and his getting to know Tavira here. 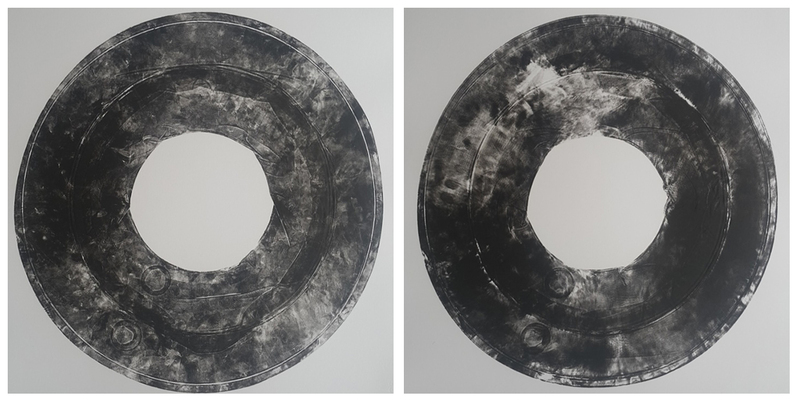 One idea I touched upon during my degree, but never found cause to repeat it within the scope of my project, was a collograph print taken from an inflatable ring my friend and I found floating in a river in Oxford. Why we decided to keep this slightly manky relic is perhaps too long to go into here. But, after we inked it and ran it through the Rochat press at Camberwell it became a clear favourite in my eyes and also expressed a strand of work that would be visually striking, fun and engaging to produce. 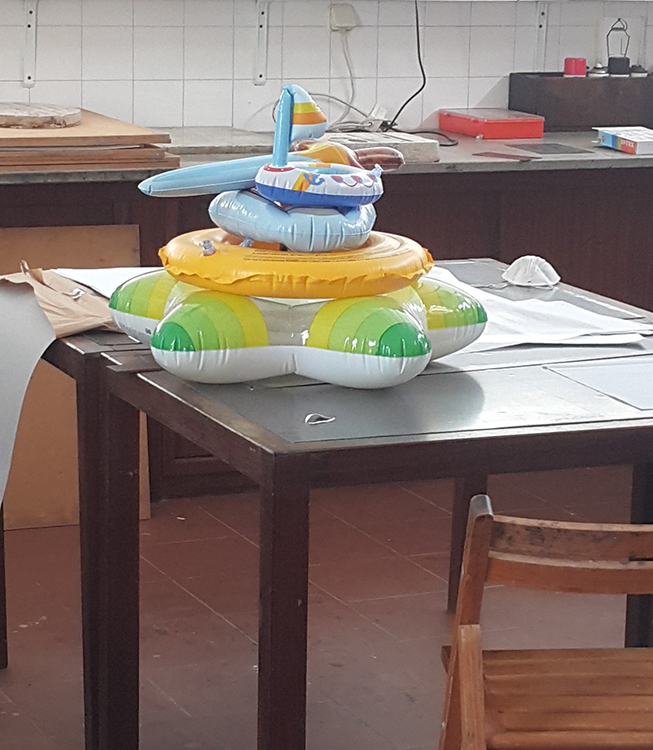 In Portugal, after a trip to the mall, (really to get an aux lead for the stereo because the Stan Getz album I had been rinsing for the past six days was getting a bit old), I returned to the studio with five inflatable objects. Many of them intended for use by babies or toddlers, because they had to be small enough to fit onto the paper. The thing with putting what is essentially a big plastic balloon through a high pressure press is that no matter how much air you squeeze out of them prior, they will inevitably explode somewhere. Depending on the size of what is being put through the press, this can sound anything between a muffled pop and a car backfiring. This did lead me to think about filling them with a tiny quantity of ink, but for fear of royally buggering up the blankets in the studio I refrained from this experiment, at least for a bit. The prints I pulled from the objects, bar the largest one, were all incredibly successful. I especially liked the texture of the smaller yellow ring that I sent back through the press, shifting the print and giving it this ghostly sense of movement. In between working, I found myself either getting small doses of sun out on the balcony and eating cured meat. When evening came and I couldn’t stomach Stan Getz’ beautiful melodies any longer, I went out to wander around the town. There was a festival celebrating the Mediterranean diet on, which provided all sorts of opportunities to stock up on fridge magnets, cakes and cacti as no walk around a town centre at 11 o’clock at night is complete without. I also had some “Algarve flavor” ice cream, which contained carob and other Algarve specialties. On the fifth day, Margarida (who runs OBS) and Soraya (a Camberwell visiting lecturer and OBS member) paid me a visit – some much needed human contact after the time spent working alone. It took me while to place Soraya, but she had visited Camberwell back in my first year and had spent much time in the etching studio. She remembered I was “the guy etching the sword”, which at the time I was. It was good to have a beer on top of the roof and chat about stuff, chat in general actually. I’d never realised how weird it felt to be speaking to someone after not doing so for the better part of a week. (A woman had come and knocked on the door to enquire about the OBS the previous day and I practically had a meltdown with being so unprepared for speaking.) They took me out for a cracking dinner at Café Romba opposite the old cinema, where we had octopus salad, cuttlefish, and some fresh figs to finish. I was taught the secret to differentiating a good Medronho from a poor one; it’s a regional spirit made from some sort of berries that I’ll probably never encounter, but is a top digestif. They made me feel better about the weird sense of guilt I had developed that I wasn’t working hard enough. After all, what is a residency but an opportunity to fully immerse yourself in the culture of the place you are visiting? Balance is key, otherwise you might as well have worked at a studio at home. My friend Ines came to visit me on the eighth day and by then I’d thoroughly settled in. We ate like kings for the next few days, hit the beach where we had a proper swim in the green-blue water, which was deliciously warm and we explored the town even further. Interestingly enough, there happened to be an exhibition on at the castle called Palace of Awe. I think the idea of the exhibition was that the curator was working with the archives of various regions of Portugal, as well as the national art archives, bringing pieces together to tell some history. Some of the historical items were quite interesting, and altogether the show was very aptly executed. Ines told me that some of the artists were quite big names in Portugal, but I would definitely not have known this on the first run through. Which brings me to some advice: anyone doing a residency here should either brush up on your Portuguese significantly, or preferably, find someone that actually happens to be Portuguese to show you around. You’ll get so much more from the place with a little insider know-how, and the whole adventure becomes a thousand times better. On the tenth day, Paul Coldwell (Professor of Fine Art) arrived, I greeted him and his wife (Charlotte Hodes, also an artist) in my underpants, as I hadn’t actually risen from bed at this stage, but I threw on an apron for a bit more modesty and we sorted stuff out. Over the rest of my trip the work I had been producing up to this point, namely the etchings, started to take real shape. I did become conscious of my working patterns and tried at least to match Paul and Charlotte’s work approach somewhat, although I was never going to change a habit of a lifetime and miraculously become a morning person. I had started to slip toward a sort of holiday mode, without any reference point for what a working holiday is; I was either all work and no play, or all play and no work. Unlike me, Paul and Charlotte had come with some projects that they wanted to work on, using laser cut plates as the basis for relief prints. I had shared working space with other artists before both inside and outside Camberwell; there was a familiarity and efficiency to how Paul and Charlotte operated that I don’t think is the sort of thing that one develops from just a few years of working together. Comparatively looking at my shambolic table strewn with receipts, sketchbooks and varnish clotted paintbrushes, walking around the place barefoot, I did feel like the prodigal son of sorts. In the last week of my visit I endeavored to make some decent editions: some sellable prints rather than a few forgettable one-offs to merely act as a record. 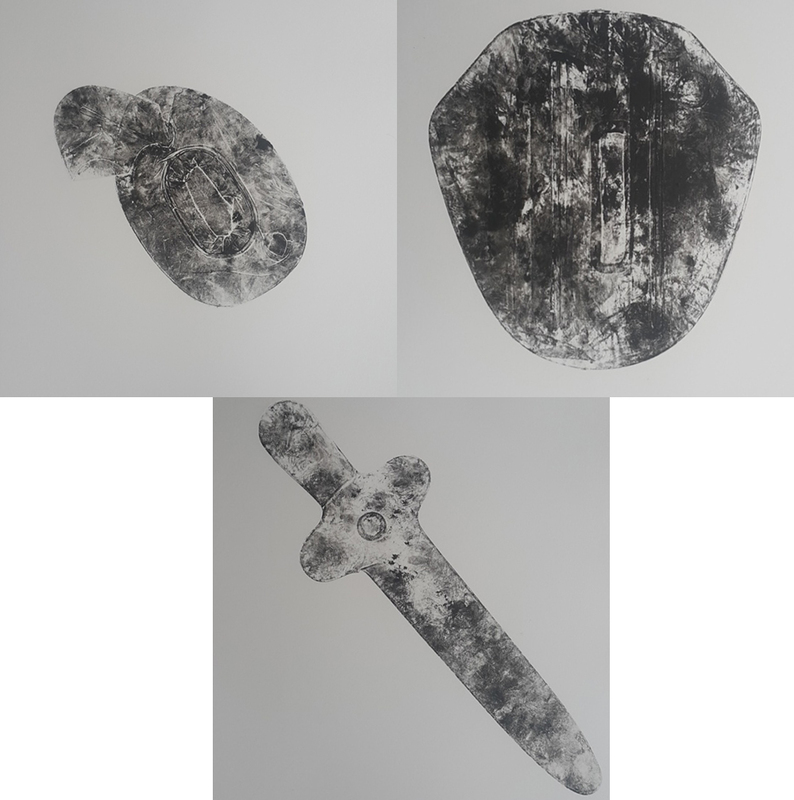 After my degree I was fully aware I was out of the swing of printmaking, but producing prints with Paul reminded me of just how many nuances etching has, even beyond the plate making process. So used was I to working with rough and ready steel I’d fallen into the habit of scrubbing my aquatinted plates with scrim. 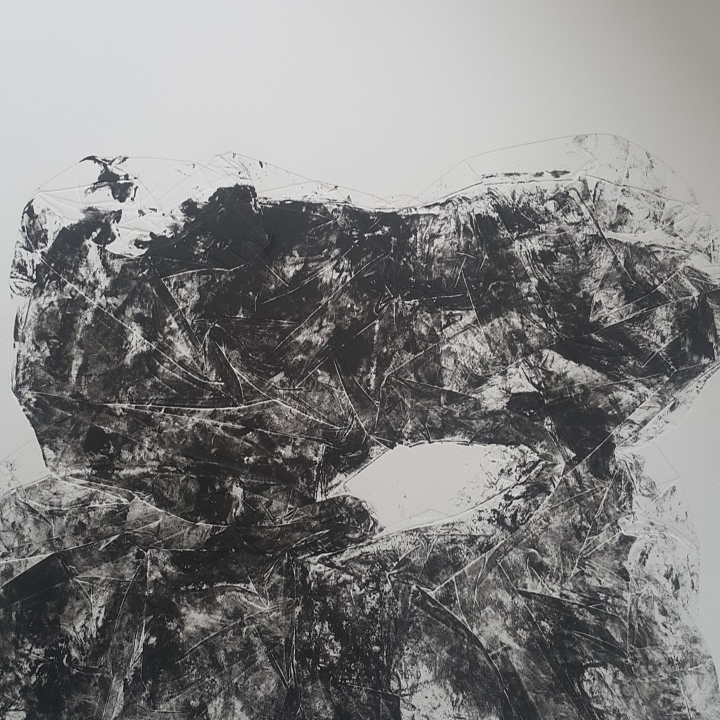 Only when my blacks were starting to come out upsettingly faded with my zinc plates did Paul show me the subtleties of wiping that I had forgotten and reminded me that zinc suffers abrasion; aquatints are far more delicate and deserving of better care. He also showed me the wonders of extender, a substance I was up until now familiar with purely academically, that enabled me to get far more range from a heavily-toned plate than with neat ink alone. It solved so many problems I had experienced with plates in the past, where for one reason or another they had been pushed too far and lost their tonal information, or the ink I was using was difficult to handle. There were many little nuggets of wisdom that I had always sort of half-acknowledged and pushed aside in favour of my own idiosyncratic approach to printmaking that were being imparted here by example. To see them executed so deftly and with such miraculous results reminded me that no matter how confident a printmaker you are, there are always tricks, some textbook, some taught in person, that can totally change the way you work. To wax lyrical even further, what makes a printmaker different from any other artist is attention to consistency. Paul showed me that when editioning, the object of the exercise is to trim down as many variables as possible to keep the results controllable and predictable. These are simply a case of good working practice and adequate preparation. Sorting your paper in advance; cutting it and soaking it all at once, thereby removing inconsistencies in the paper’s structure that develop over a long day of printing. I shall confess that unless I am working toward a super clean finished product, my general printmaking conduct probably leaves a bit to be desired, a tad laissez-faire. 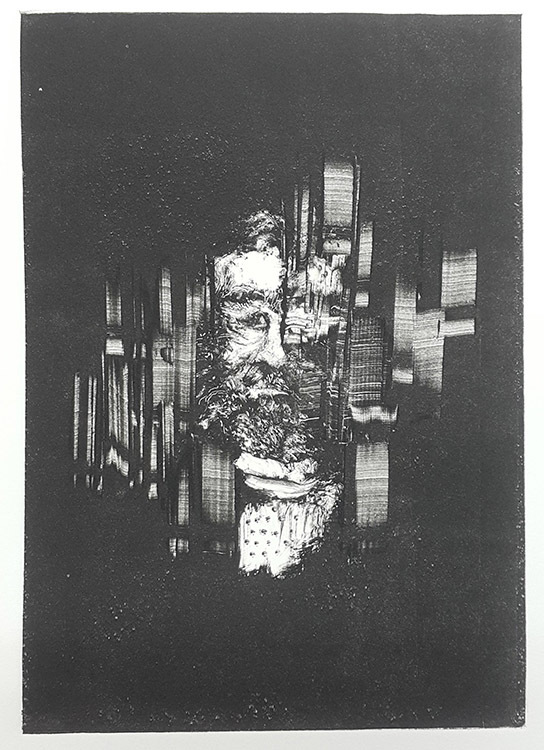 Paul reminded me of the professionalism that printmaking demands, that really needs to be considered as standard in one’s practice rather than an option. At the end of the fortnight I had built up a reasonable tan, developed a mild addiction to cured meats, and produced a varied and fairly interesting body of work that was to provide a springboard for my other studio residencies back in London. I packed it all up into the box I had sent my paper over in with the help of Paul and his mad wrapping skillz, said my goodbyes, and dropped it off at the post office. After a farewell nata (a Portuguese custard tart) and an espresso on the square I had the trip back to Faro ahead of me. Coupled with the inevitable realisation I had left something vital behind (in this case my laptop charger) and a two and a half hours battle with my own oversized legs on a Monarch flight, I already missed Tavira.